Four hundred talented young musicians performed to a full house in a St Barnabas Church, Pitshanger Lane, Ealing on Saturday (July 5th). 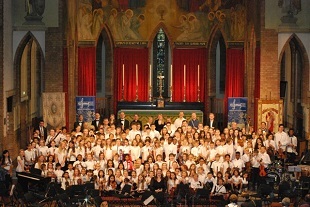 All pupils of Ealing Junior Music School, which meets on Saturday mornings, they excited and delighted an audience of 300 parents and friends with music ranging from Stravinksy and Haydn to Dizzy Gillespie and The Beatles, performed by 18 different bands, orchestras, choirs and ensembles. The evening ended with a grand finale of James Bond theme tunes by the school’s philharmonic orchestra. Earlier in the day the school’s acoustic and rock guitar bands performed at Twyford High School. The two events marked 21 years since EJMS became a charity. EJMS almost closed in the recession of the early 1990s when Ealing Council could no longer fund it. It was saved in 1993 by a group of parents who formed a charitable trust. Since then pupil numbers have increased three fold.